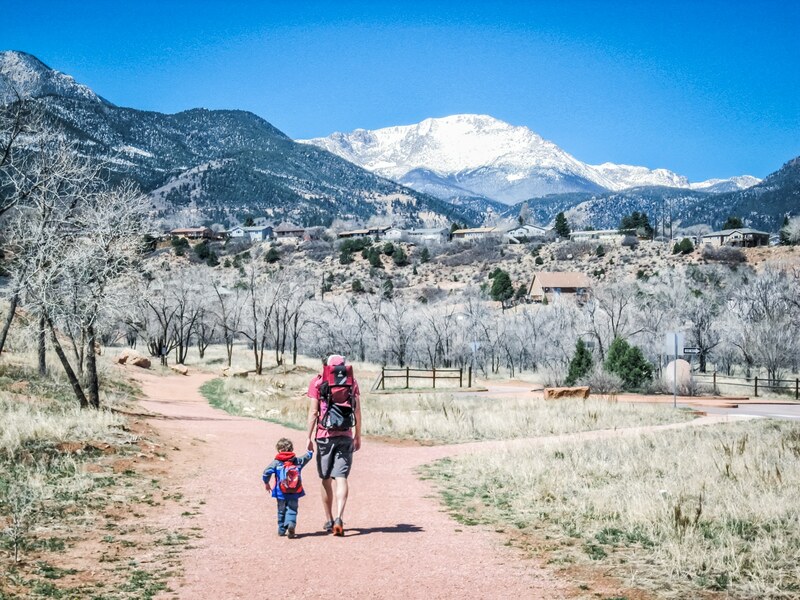 Here’s good information on some of Colorado Spring’s best hikes. Trail descriptions are roughly sorted by their general location in the city. 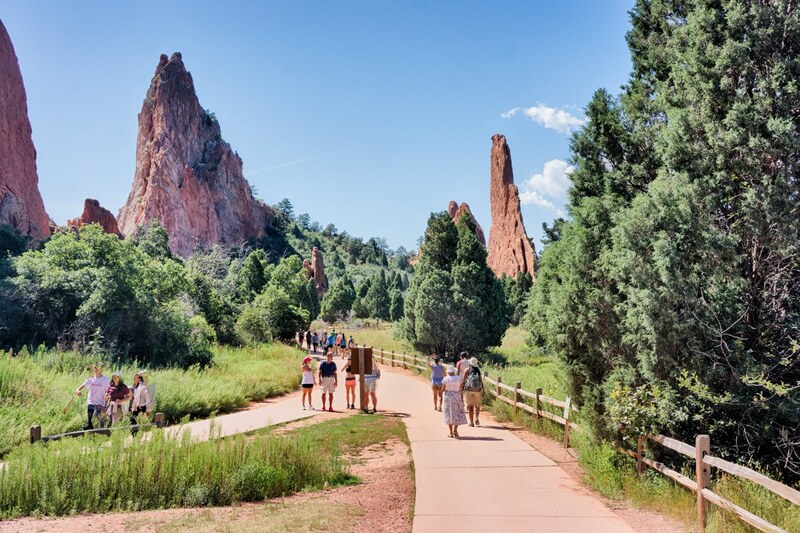 Garden of the Gods more than holds its own amongst Colorado Springs hiking options, offering a sublime mix of paved and unpaved routes. Most visitors stick to the paved walkways snaking throughout the iconic red rocks, especially from the main parking lot on the north end of the park. The paved trails are pleasant and accessible to strollers, wheelchairs and a wide range of fitness types. I love to leave the paved trails and explore single track combinations. A personal favorite is the Palmer Trail situated along the west side of the park. The route is one of the more technical, but it provides spectacular views into the NW corner of the Garden. 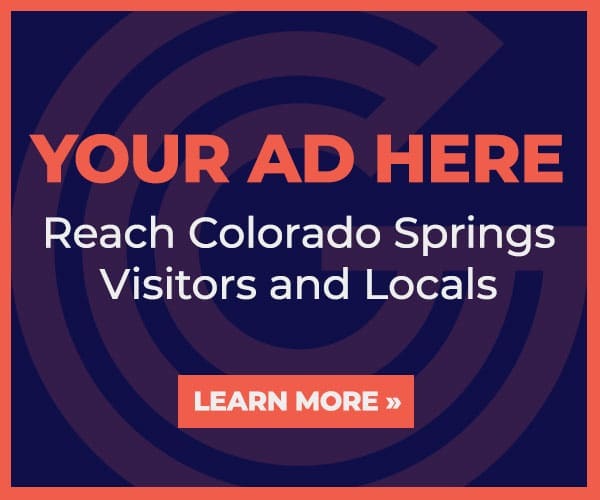 If you are hoping for some mild options (besides the mandatory central Garden trails), consider exploring the Rock Ledge Ranch historic site, and the the Foothills Trail on the east side (near the main visitor’s center). For more route ideas, be sure to check out Eric’s article on 5 classic Garden of the Gods hikes. There are limited mountain biking options in the park, however, road bikers will find miles of bike lanes and challenging hills. Distance: Varied. Distances can range from a stroll to decent mileage (ie: 6-8 miles). Endless combinations are possible, and a determined soul could easily put together a longer tour. 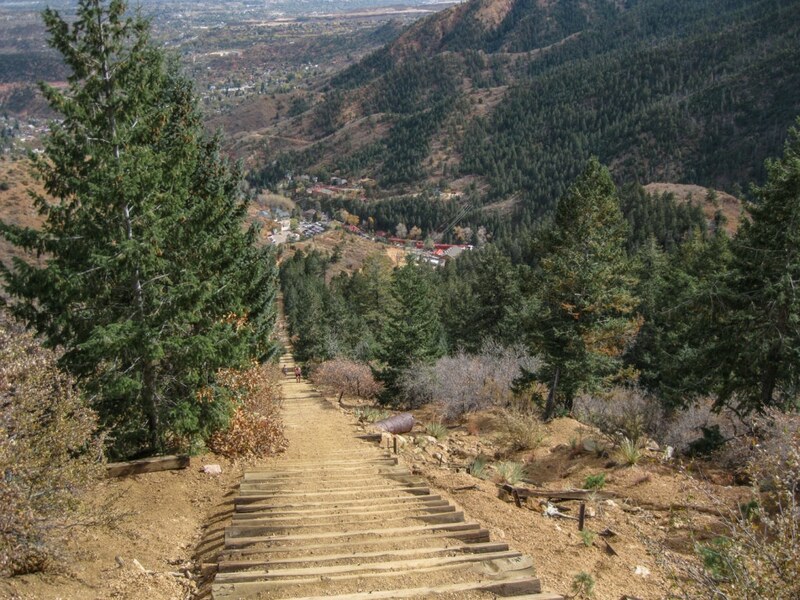 The Manitou Incline near Colorado Springs, on the lower flank of the Pikes Peak landmass, is a legendary 1 mile ascent along an old cog railway route with 2,000′ feet of gain. The trail is a combination of dirt, gravel, rocks, and railroad ties situated amongst high desert and forest vegetation. At the summit (there is a false one on the way up, don’t forget!) hikers are rewarded with a great view of Manitou Springs. I’ve observed most people taking about 1 hour to climb to the top. Elite athletes can get up the Incline in about 20 minutes (my best time is 29:56, I think Eric did it in 27:27). It may take slower hikers as long as 2 hours to climb the Incline. The Manitou Incline compared to other noteworthy landmarks, and the Boston Marathon. The official return route takes a more gradual route down the Barr Trail (the official trail up Pikes Peak). A large number of hikers tend to run down these few miles of trail. In the wintertime, when the Incline and Barr trails become icy, locals don traction devices like Kahtoola Microspikes (or Nanospikes), Yak Trax, or even screw shoes. I’m a fan of Kahtoola Microspikes, and have run headlong down snow and ice in them. Visitors and locals alike often misjudge the difficulty of The Manitou Incline, and are seduced by the novelty. Do not attempt the Manitou Incline unless you have good cardiovascular fitness. Distance: ~1 mile up 2,000′. 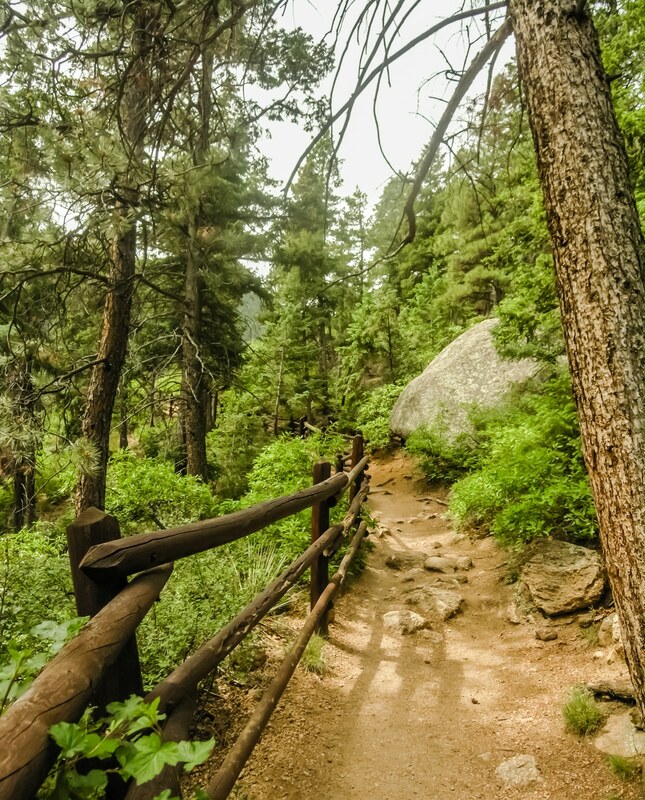 Return via the bottom 2.5 miles of the famous Pikes Peak Barr trail. View of Pikes Peak from the Barr Trail. 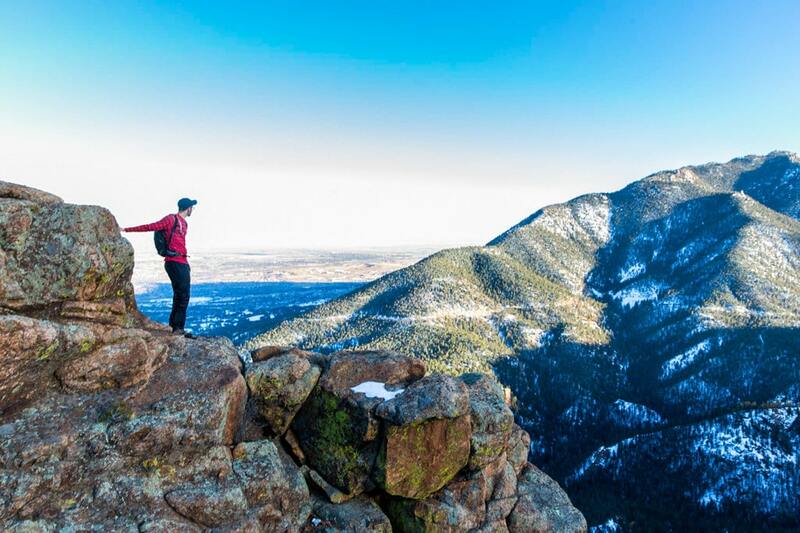 Wondering how to hike to the top of Pikes Peak? 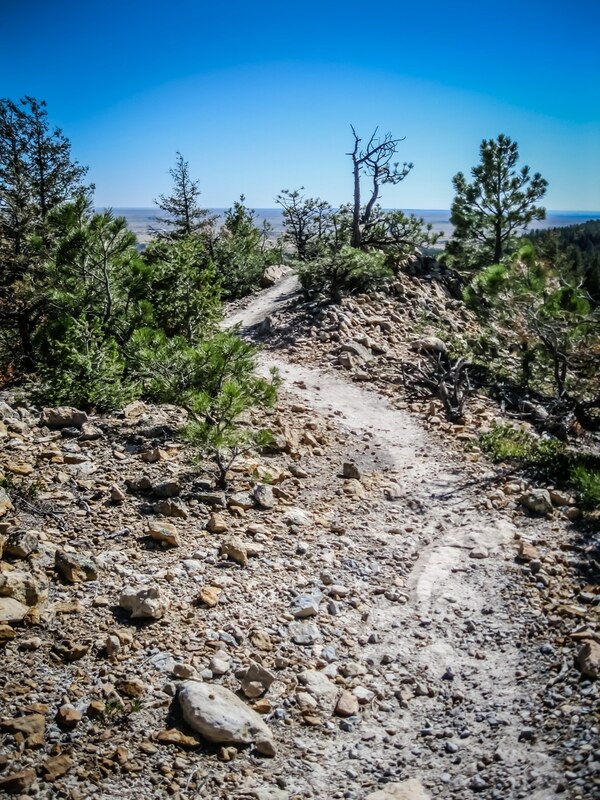 The legendary Barr Trail will take you all the way to the summit. The trail is 13 miles one way (roundtrip is a 26 mile marathon) and gains 7,800 feet. Of all the Colorado 14ers, this is the greatest gain of any trail. This old mule trail starts in scrubby oak, transitions through pine and aspen, onto the rocks high above timberline, and to the summit. Halfway up the trail is Barr Camp, a great place to camp, rest, and even get a meal (if you make reservations). Lower stretches of the Barr Trail on Pikes Peak. The bottom of Barr Trail is near the Manitou and Pikes Peak Railway depot and the first 3 miles are some of the steepest on the entire trail. It’s possible to encounter extremely hot conditions at the bottom and winter weather at the top, be smart. 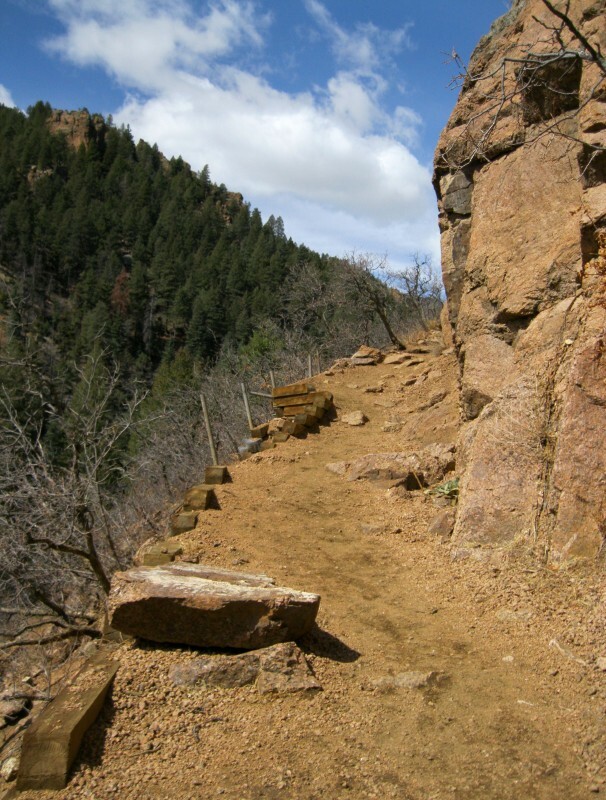 Barr Trail is advanced and offers an impressive challenge for the motivated hiker (or runner). There are some interesting variations off of Barr (Long’s Ranch Road, Elk Park Trail, others) as well. 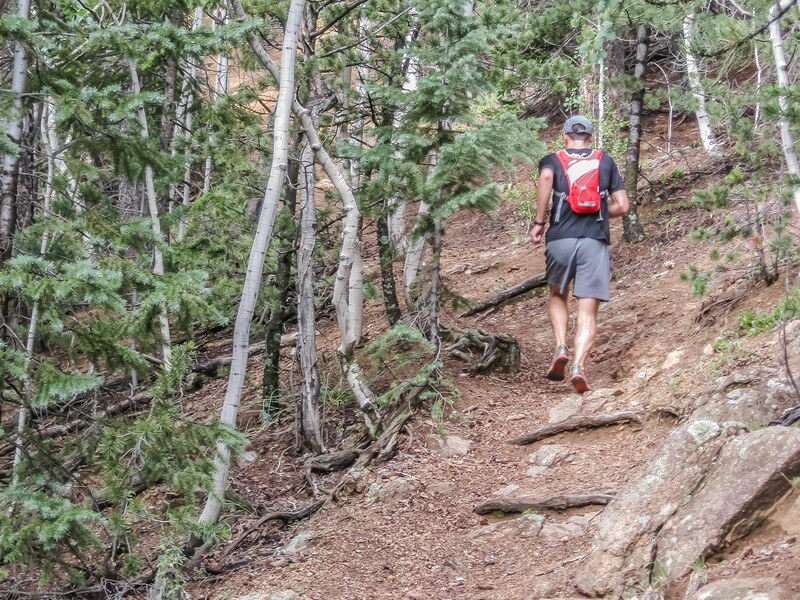 The beginning of the trail usually has a lot of downhill traffic, that’s because the Barr Trail is the return route for Manitou Incline trekkers. Those in hope of a quiet hike will find it once they’ve passed the point where the Incline connects (a 2.5 miles up the Barr Trail). Heading towards the kid-friendly Contemplative Trail at Red Rock Canyon Open Space. Pikes Peak keeps watch. 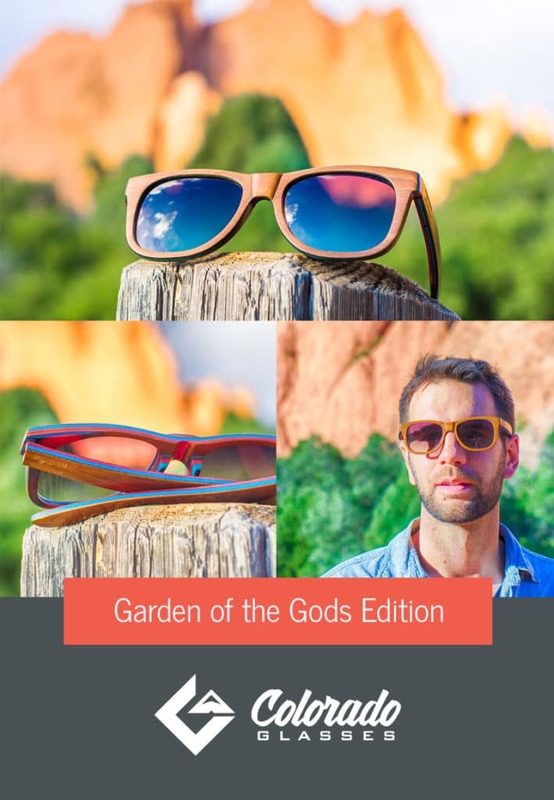 Here’s a tip from a local: Red Rock Canyon is the local’s Garden of the Gods. Can’t get enough hogbacks? Need another rock climbing option? Love to mountain bike? Check out Red Rock Canyon. There’s even a mini bike obstacle course. If you have a family with young ones, try the Contemplative Trail. 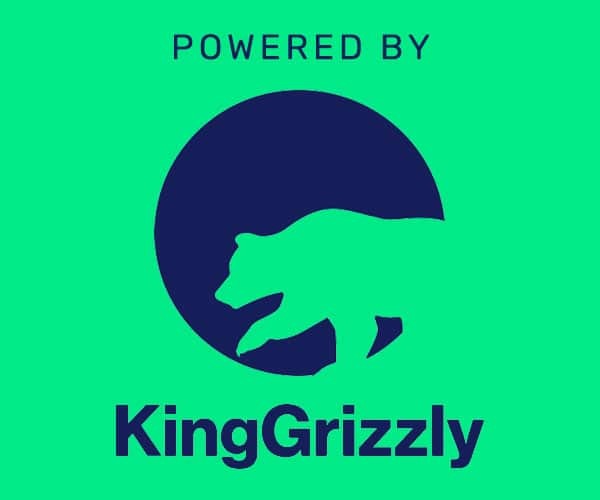 If you are an experienced trail runner looking for serious miles and vert, run through the open space and turn it into a 10 mile loop by including Section 16. It’s possible to connect Red Rock Canyon to Bear Creek Open Space, High Line Drive, Intemann, and other trails. Eric and Sydney out for a trail run at Austin Bluffs Open Space. Pulpit Rock always surprises. It sits in the midst of urbanity, sandwiched between a large shopping center, a university (UCCS), and housing. Despite this proximity, Pulpit Rock has a surprising variety of trails, and terrain. The most obvious route is to scramble up onto the rock formation itself. The namesake route is a moderately difficult scramble, but there are also some easy trails down below the rock. 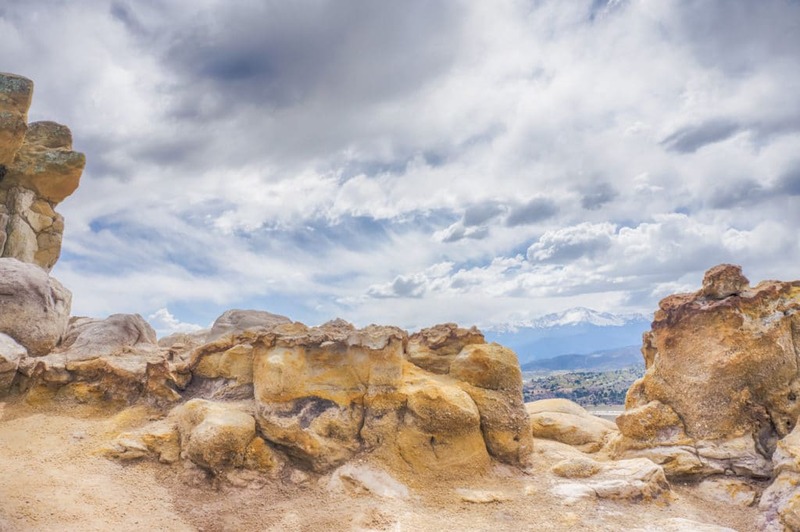 Otherworldly formations near the top of Pulpit Rock frame Pikes Peak. Watch out for snakes in the summertime. I’ve seen rattlesnakes here more than once, as well as at the Garden of the Gods. If you see one, give it a wide berth and be nice – snakes are just trying to mind their own. Leaving the upper reaches of the Seven Bridges Trail. Math aficionados will love the Seven Bridges Trail, a challenging out and back with plenty of vertical gain, and seven creek crossings to boot! Seven Bridges sits above Gold Camp Road, on North Cheyenne Creek (there is a big dirt parking lot above the Helen Hunt Falls area). The trail proper is about 1.6 miles one way, but there’s a .7 mile approach along an old railroad bed. This is a strenuous hike, and can be quite icy in the winter time. I love to beat the heat on Seven Bridges in the summers. Seven Bridges can be changed to numerous other mountain trails for near endless high mountain exploring. Eric testing a new pair of shoes at Stratton Open Space. Stratton is a great little open space situated on the foothills. The treasure of Stratton is an unbelievable mountain bike trail called “The Chutes.” Think roller coaster. Think Chutes ‘n Ladders. Think banked turns. What are you waiting for? Chain this with Cap’n Jacks and send us a “thank you” email later. Hiking and running on The Chutes isn’t recommended since bikers come barreling downhill (I have run down it in the winter with spikes – it was a blast). There are plenty of routes besides for those on foot. Expect to find relief from the sun in the summertime since a number of the routes are shaded by the woods. Getting ready to head down the exquisite backside of Section 16 in Colorado Springs. For a surprising mix of red rocks, woods, canyons, creeks and views, check out Section 16. The best way to prepare for this hike is to realize you may start second-guessing the idea about 1/3rd of the way through (if you hike my recommended CCW) on a steep series of switchbacks in the woods. Don’t give up, the reward at the top of the hill, and last 2/3rds of the hike are worth the hard work! As a trailrunner, Section 16 is a personal favorite. 5.5 miles and 2,000′ of gain are a great challenge, especially running up the climbs on the first 1/3rd of the route. Topping out to discover exquisite views over the city and plains, then running an ideal grade along canyon contours are a rush. If you are a trail runner, you’ll be hard-pressed to find a better downhill grade. Get ready to fly. Park at the Section 16 trailhead on Gold Camp Road and head up the stairs into the oaks to start this loop trail. If the parking is full, park further down at the junction of Gold Camp and High Line (the dirt road). Bear Creek is a wonderful city park with a huge (seriously, it’s huge) dog park, lots of grass, a playground, tennis, basketball, picnic facilities, and a challenging trail system. East of the main park are flat, gravel trails. West of the park are hilly dirt trails which climb through scrubby vegetation back to the Section 16 area. It’s possible to link Bear Creek up to Section 16 on the west and Pikes Peak Greenway on the east. Heading back down from Mt. Rosa (not pictured) in winter. Mt. Rosa is my favorite hike in Colorado Springs, requiring great fitness. Looking at the peaks from town, Rosa is the most classic looking peak (nice and pointy), towards the south side of the Springs. Walking the ridge towards the Mt. Rosa summit area. I like to hike up past St. Mary’s Falls, summit, and then return by dropping off the backside and returning down the Seven Bridges Trail. Not for the faint of heart, summiting Rosa from the Springs side is at least a 13 mile trip (total) – the route I like is about 15 miles. It’s possible to access the peak from the backside and significantly reduce the roundtrip distance (totaling 7.2 miles), but this requires a long drive on forest roads. You may also encounter reckless target shooters near the backside trailhead. Explorer Zebulon Pike climbed Mt. Rosa by accident when he attempted to summit Pikes Peak (now named after him), and was forced to spend the night in a cave below the Rosa summit. A portion of St. Mary’s Falls. Colorado Springs is a high desert climate, but there are some waterfalls to be found by determined souls. One of the more remote falls is St. Mary’s Falls, tucked high in the woods above the Helen Hunt Falls area. The trailhead is located at big dirt parking lot where High Drive and Gold Camp Road intersect. After a mile of forest road walking, the trail to St. Mary’s Falls begins above a collapsed tunnel. I enjoy the singletrack into the falls. It sits in Buffalo Canyon and parallels the creek. There is a fair amount of climbing, but the reward in the summertime is well worth it. Running out is a blast. 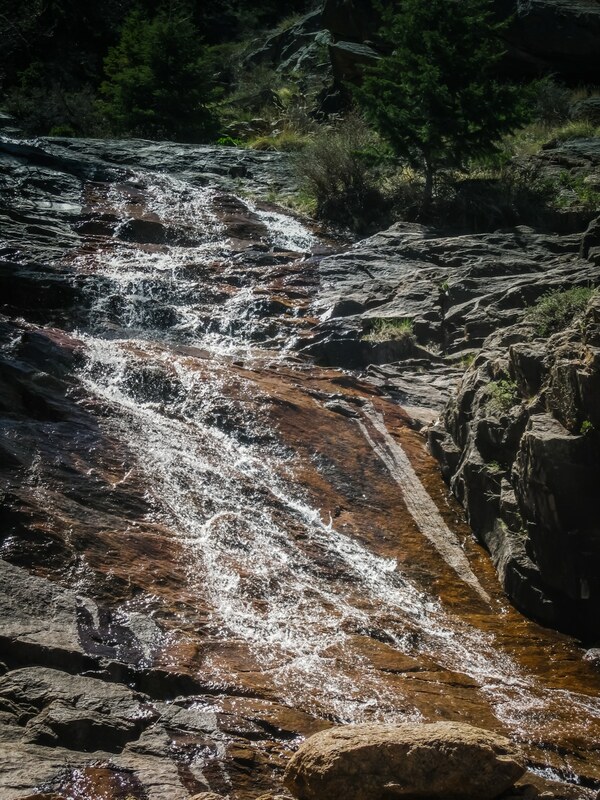 The water running on the slickrock drops into Helen Hunt Falls. Helen Hunt Falls is the easiest waterfall area to see in Colorado Springs. Located in North Cheyenne Cañon Park, the falls can be viewed from the road and a short .6 mile roundtrip hike to Silver Cascade Falls begins across the bridge over the falls. The trail is well maintained and reasonably safe for smaller children thanks to the presence of handrails. There is also a visitor center and gift shop at the foot of the falls with exhibits, helpful staff/volunteers and scheduled activities. There used to be an inn at this location, Bruin Inn (est. : 1881), but it burned down years ago. The existing visitor center is a rebuilt version of the only outbuilding remaining after the fire. 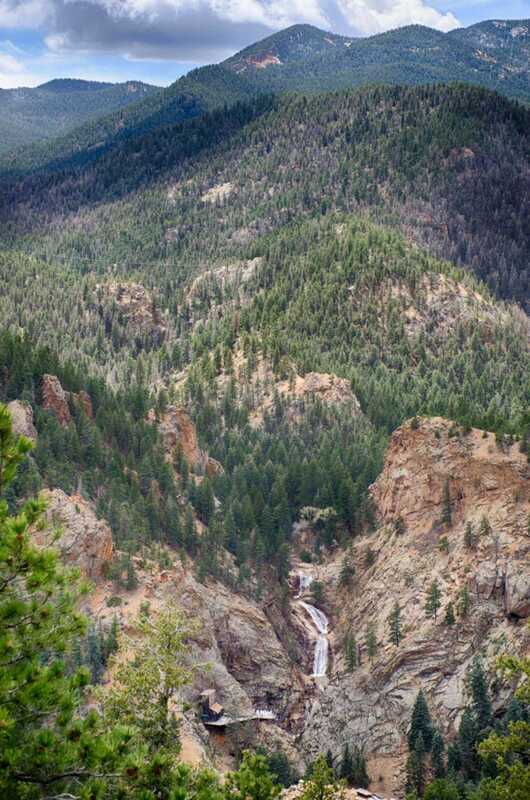 Seven Falls as viewed from the Mt. Cutler trail. A zipline can be spotted in the photo. Seven Falls is a commercially owned ribbon of water near Cheyenne Cañon. After the falls were decimated by torrential flooding in 2013, the Broadmoor purchased the attraction and spent $12 million renovating. Besides a great waterfall and catwalk, the area now boasts a restaurant, shopping, exhibits and zip lines. Columbine is a circuitous, climbing trail up Cheyenne Cañon from the Starsmore Discovery Center to the Helen Hunt Falls area. Besides being a stiff challenge, the trail yields some great views of the canyon area and beyond. Plus, it can be accessed at three points (lower, mid, and upper) so it is possible to sample the trail. The first time I went up Columbine was during a 12 mile trail race – hard! In terms of mountains, Mt. 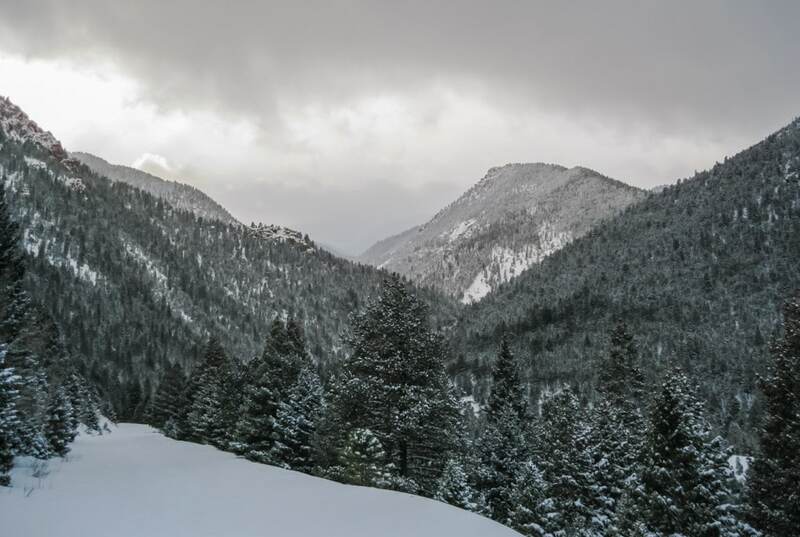 Cutler is a relatively easy and small mountain to summit – harboring fantastic views of the Colorado Springs and the plains. Located above Cheyenne Cañon, Cutler can be summited and descended in a few hours. Runners comfortable with climbs can make the round trip in an hour or two. If Mt. Cutler seems too easy, hang a right at the saddle and head up Mt. Muscoco. The gain is about 1300′ from the trailhead in Cheyenne Cañon and tops out for some nice views of the plains and mountains. The route feels more solitary and tops out around 8020′. Fall at Cheyenne Mountain State Park. Topping out at Cheyenne Mountain State Park. 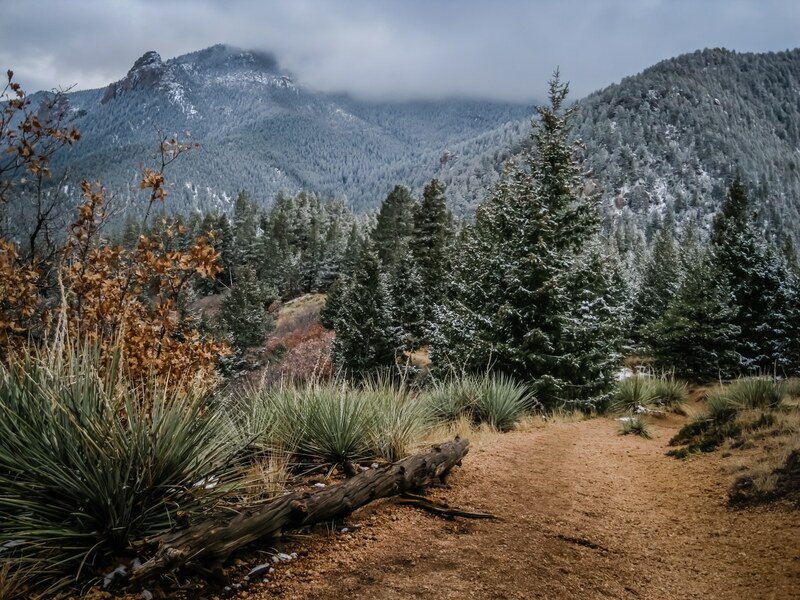 Cheyenne Mountain State Park has over 28 miles of diverse trails with a wide variety of terrain, vegetation, and difficulty. Mountain bikers will have a blast at the park and must try the two Talon trails (North and South Talon). 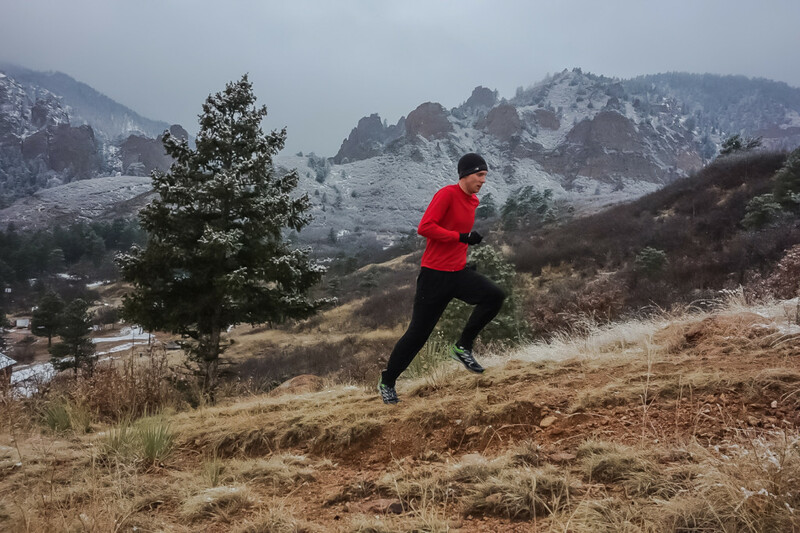 There is enough variation in vertical gain that I once ran a marathon at the park encountering rain at the bottom of the trails and multiple inches of snow on the higher terrain. A pleasant visitor’s center is worth checking out and RVers will be pleased with the camping options at the park. 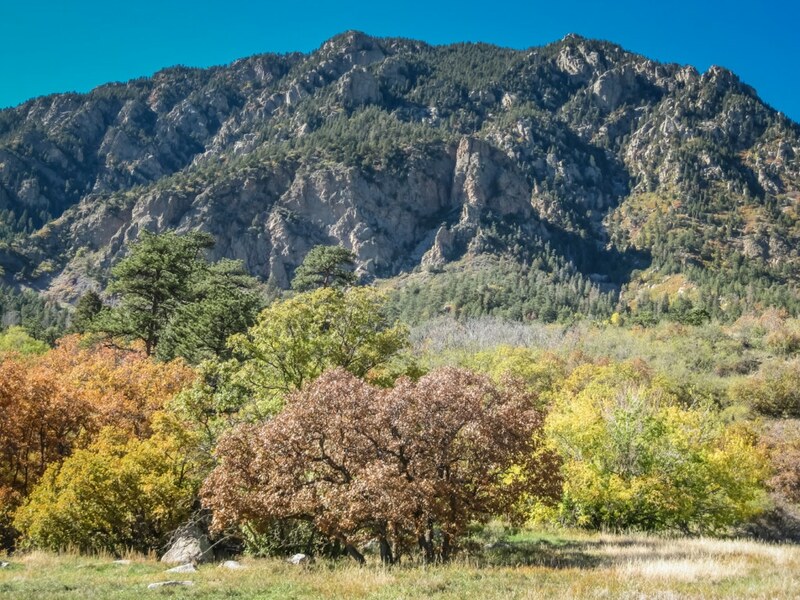 The crown jewel of the park is the Dixon Trail which climbs all the way to the top of Cheyenne Mountain and connects to a 3.6 mile Top of the Mountain Trail. Eric heads for an arch at Ute Valley Park. Snow is no excuse for staying inside! Ute hides out on the NW side of Colorado Springs, and is easily overlooked (locals like it that way). The city just doubled the size of the park which includes a nice variety of mixed terrain (slickrock, climbing, valleys, dirt, rocks). 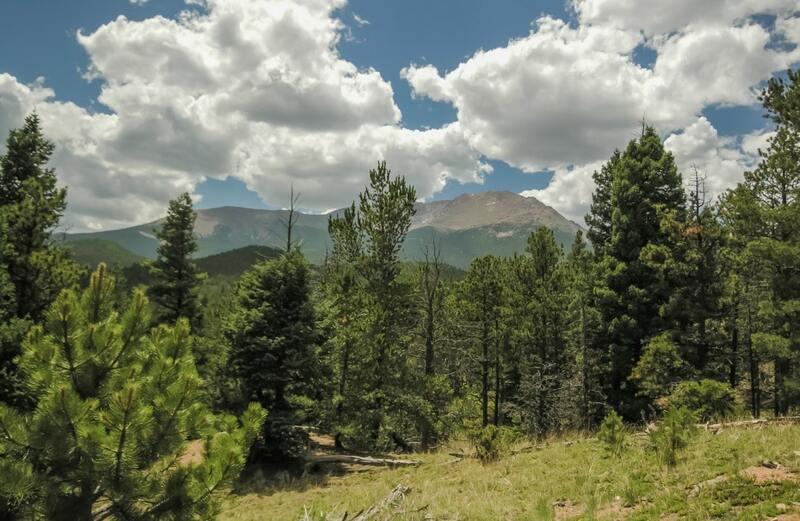 Notable landmarks include a prominent hogback and perpendicular ridgeline which affords great views of Pikes Peak. 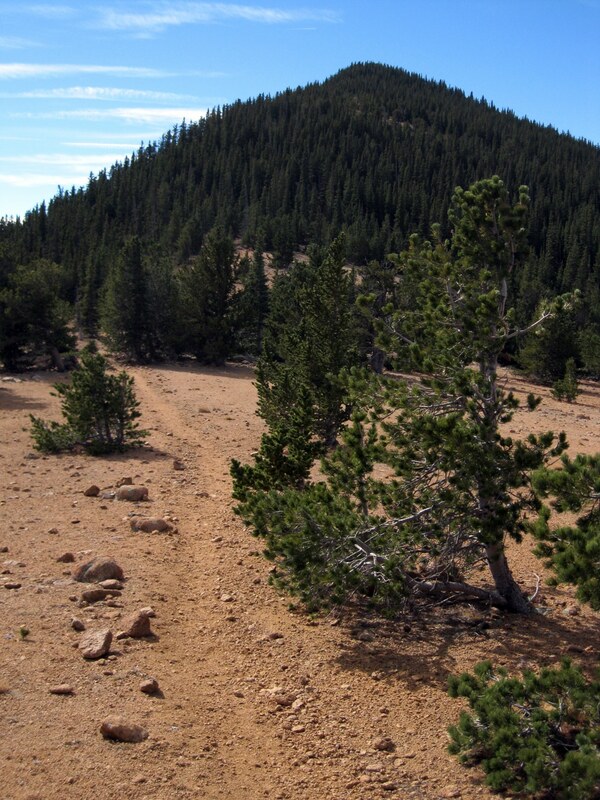 Blodgett Peak is a rugged outcropping on the northwestern edge of Colorado Springs. 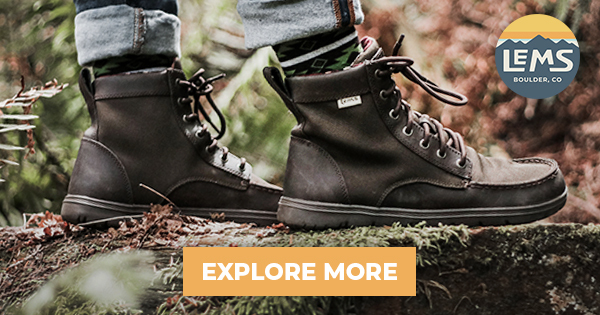 Hikers will be challenged with steep terrain, unreliable footing, and perplexing wayfinding. The reward for hiking Blodgett are great views in all directions, including Pikes Peak, the plains, and the Air Force Academy. 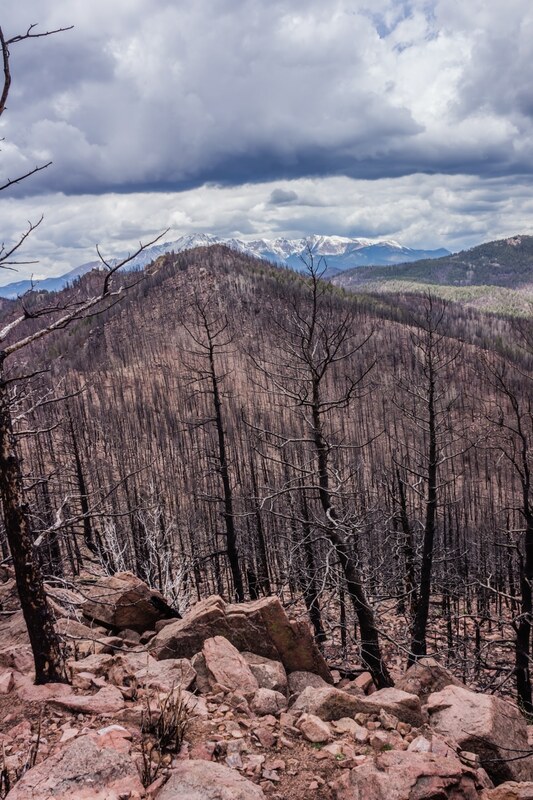 Fire damage near the summit of Blodgett Peak. There are multiple routes up Blodgett. The recommended route is to follow the canyon up the left side of the peak. Wandering too far onto the face of Blodgett puts hikers on a technical scree slope (lots of loose boulders). A route from the scree and to the summit exists, but involves an extremely difficult canyon with multiple exposed climbs. Athletes love the standard route for the thigh and calf burn! 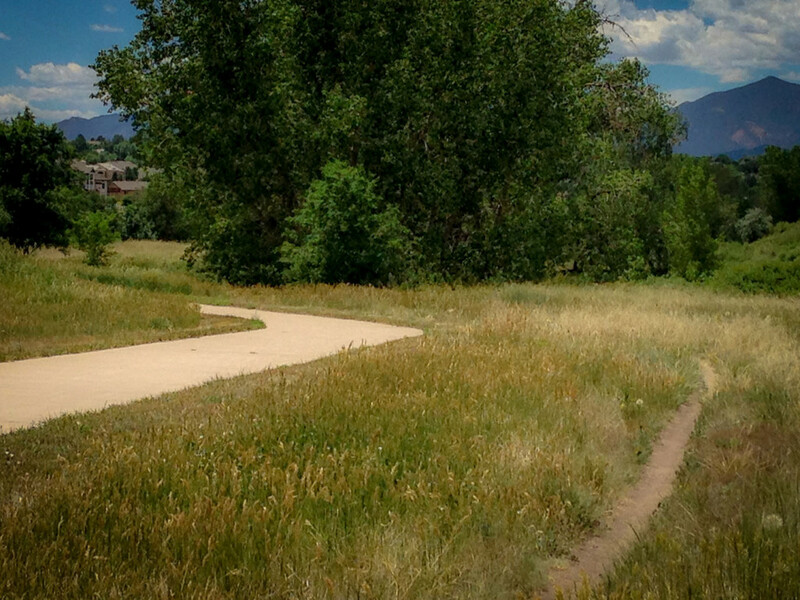 Part of the American Discovery Trail, this 14 mile section of the trail rolls through grasslands and woodlands along Fountain Creek. The trail is wide, graded and great for easy strolls or long distance efforts. 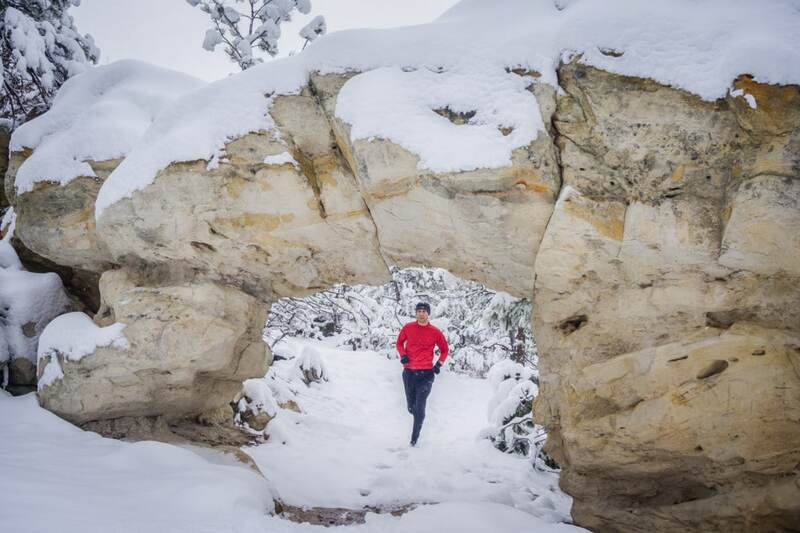 Runners like to use this trail for training since it is relatively mild compared to many of the trails around Colorado Springs. Much of the trail is on Air Force Academy property which does close depending on security levels. When this happens, it is possible to get a few miles in on the south end (Woodmen side) before hitting the gate. Those on the north end can head away from the academy (north) instead of south. Without a doubt, one of the best hiking and riding trails is on the Air Force Academy. Depending on academy security levels, civilians can use the Falcon Trail, a 13 mile loop with plenty of variety, elevation change, and jaw-dropping scenery. If you try the trail, I suggest going counter-clockwise, starting from the east side near the stadium. This will front-load most of the climbing and set you up for a holler-inducing descent. In the summertime, the creek area near Stanley Canyon is paradise for a quick splash of cold water on the face and neck. Due to the distance on this loop, the difficulty is moderate-high and requires good fitness. Be sure to check whether the trail is open (I’d try calling the visitor’s center) to civilians before making the drive. Out for a trail run at Palmer Park. Palmer Park is a mesa-like landform with over 30 miles of trails right in the middle of Colorado Springs. 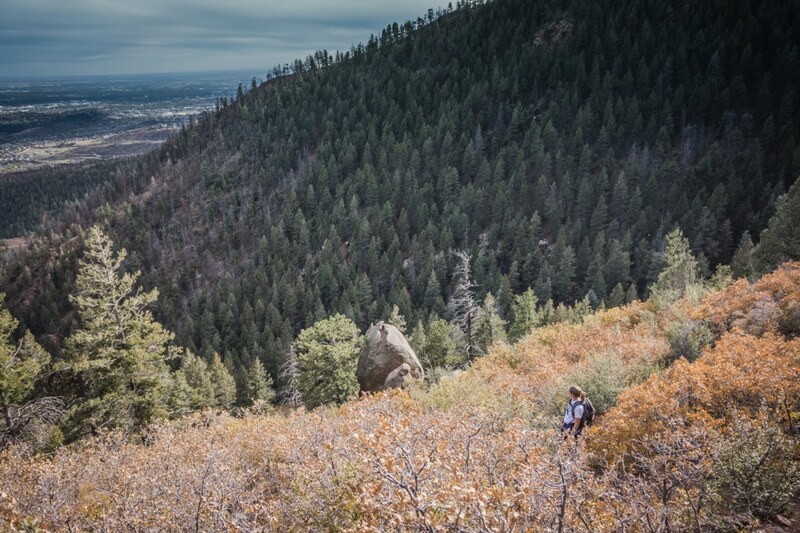 Known for a wide variety of terrain and difficulty, Palmer Park is a great place to hike, run or mountain bike. It is also dog-friendly, including a dog park and off leash area. There are wonderful overlooks of the city in all directions, as well as a baseball field and playground. 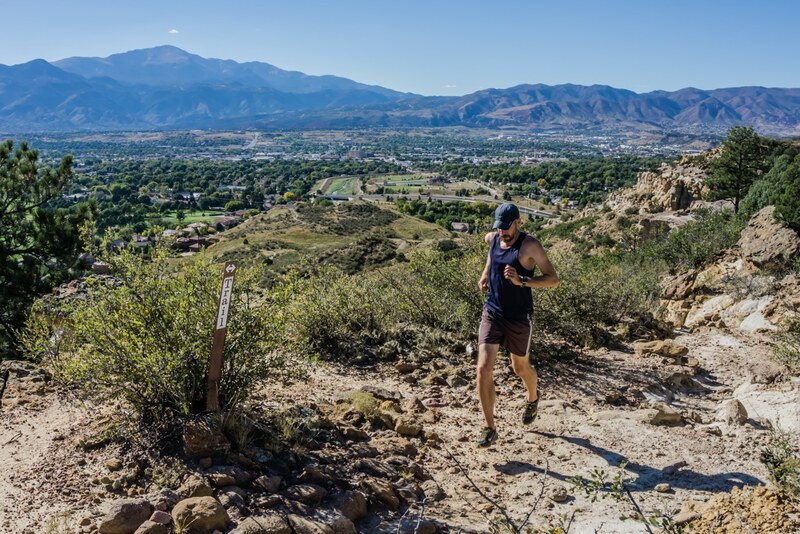 Advanced trail runners and hikers will love the challenge of the Templeton Trail which features challenging rocks, vertical gains/drops, and great views. Flat trails are hard to come by in Colorado Springs. For a rare stretch of flat, hit the Pikes Peak Greenway trail at Monument Valley Park near Colorado College. The park is near the downtown area and runs along Fountain Creek. Expect to encounter hard-pack gravel, plenty of other hikers/walkers/bikers, and even some homeless folks. Monument Valley Park proper has some great circuits through beautiful trees and grass. There are even distance markers. Heading south on the Greenway Trail passes by the beautiful Colorado College and their nice sports facilities. Distance: Varied. It’s possible to get a few miles in the park vicinity, but can be extended on the Greenway trail for many miles. This stretch of the Cottonwood Creek urban trail is east of Cottonwood Park. Cottonwood is a large city park an urban trail, a playground, grass, frisbee golf, roller hockey, basketball, baseball, soccer, and even a YMCA facility. The urban trail runs east-west along Cottonwood Creek. It’s easy to string a few miles together walking, running or biking. The creek can be crossed at Union or Rangewood to create a loop. Distance: Varied. It’s possible to get a few miles in the park vicinity, but can be extended on the Cottonwood Creek trail for more miles. A handy interactive map where you can sort and filter by name, distance, difficulty or general location. A nice selection of hiking available in Colorado Springs and within an reasonable driving distance. Some of the listed trails range farther out from the city than those covered in my article. This opens up new possibilities, such as The Crags. 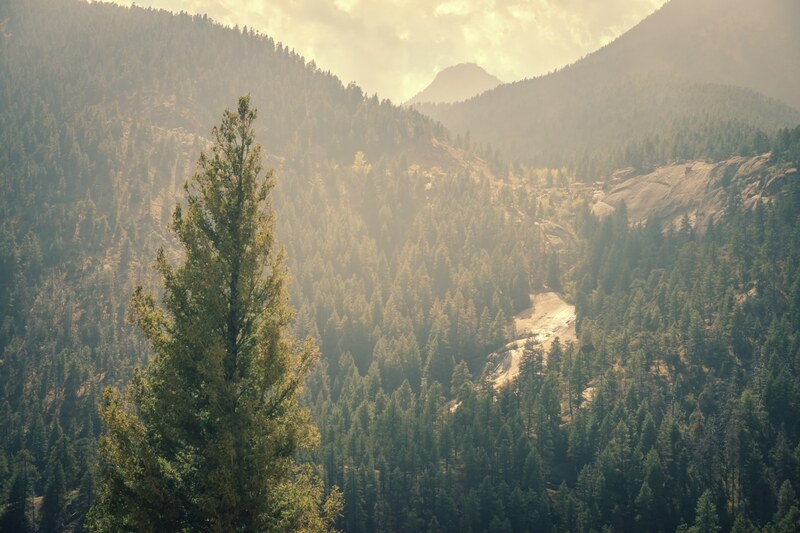 A list of places to get outdoors in and around Colorado Springs. 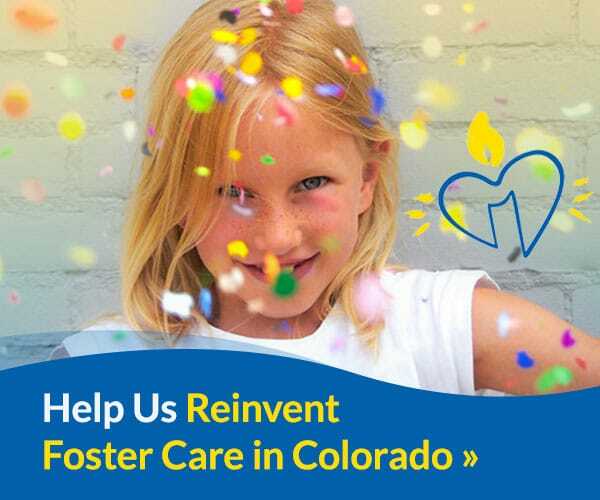 Put together by The Trails and Open Space Coalition, a 501c3 nonprofit created in 1987, and committed to preserving open space and parks and creating a network of trails, bikeways and greenways for the Pikes Peak region.